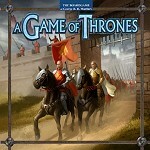 Fantasy Flight’s A GAME OF THRONES board game has been doing so well that they are planning an expansion. The first version of the game allowed for only five players: Stark, Lannister, Greyjoy, Baratheon, and Tyrell. The expanded version will allow House Martell of Dorne to join the fun, and compete for supremacy in the Seven Kingdoms. The expansion will also include a board overlay, and rules for adding castles, siege equipment, ports, and other new wrinkles to the play, which should make the game even better… and it was pretty damn good already, says someone who played far too much DIPLOMACY and RISK back in college. Thomas Denmark did the artwork for the new package. Here’s a look. Tagged song of ice and fire.